Dhaka, one of the most densely-populated cities in the world, has poisonous air almost everywhere. Brick kilns, vehicles run by fuels with higher level sulphur, as well as construction works have been identified as major sources of air pollution. Pointing out that five of the top ten causes of deaths in Bangladesh are related to air pollution. But how dreadful is it do we know exactly? For high pollution level Dhaka city has continued to rank as the 10th most polluted city in the world. Dhaka scored 158 in the US Air Quality Index (AQI) on January 21. The index is based on five criteria pollutants regulated under the Clean Air Act — ground-level ozone, particulate matter, carbon monoxide, sulfur dioxide, and nitrogen dioxide. The Department of Environment (DoE) has also set national ambient air quality standards for these pollutants. The standards have been set with an aim to protect human health from adverse impacts of air pollution. An Air Quality Index (AQI) standard for Bangladesh is 0-50 (good), 51-100 (moderate), 101-150 (caution), 151-200 (unhealthy), 201-300 (very unhealthy) and 301-500 (extremely unhealthy). On December 17th in 2018, the highest level of air pollution was recorded at 565ppm in Narayanganj followed by 556 ppm in Dhaka, 402 presence of pollutant particles (ppm) in Khulna, 386 ppm in Gazipur, 308 ppm in Rajshahi, 274 ppm in Barisal, 264 ppm in Sylhet and 174 ppm in Chittagong, according to a report of Clean Air and Sustainable Environment (CASE) Project under the DoE. A public notice by DoE in December 2017, states that 58 per cent of the particulate pollutants responsible for the smog in the air of Dhaka city comes from the orthodox brick kilns around and inside Dhaka, 18 per cent from road dust and soil dust, 10 per cent from vehicles, 8 per cent from burning of biomass and 6 per cent from other sources. Air pollution in the city is worsening day by day due to the absence of monitoring and necessary steps need to control it. The presence of gaseous pollutants, like Carbon Monoxide (CO), Sulphur Dioxide (SO2), Nitrogen Oxides (NOx), Ozone (O3) and Methane (CH4) has been found by the DoE in the air of Dhaka city in alarming quantity. But what is more alarming is the presence of fine dust (particulate pollutants or Particulate Matters) of Sulphate, Nitrates, Ammonia, Sodium Chloride, Black Carbon and mineral in the air, says DoE director, Md Ziaul Haque. Most damaging particles are of the sizes of 10 microns in diameter and smaller (PM 10 and 2.5) as they can penetrate and lodge deep inside the lungs. According to the World Health Organization (WHO), chronic exposure to such particles increases the risks of developing cardiovascular and respiratory diseases and even cancer in the lung and the urinary tract or bladder in human body. The head of the department of Pulmonology of Dhaka Medical College Hospital (DMCH), Biswas Akhtar Hossain says air pollution is one of the main reasons behind respiratory diseases. People develop diseases like Asthma, COPD, Bronchitis and Bronchiectasis due to long time exposure to dust. “Currently Bangladesh has 85 lakh patients suffering from Asthma, and almost 75 lakh patients suffering from Bronchitis and COPD,” said Dr Biswas. He also says there is no doubt that dust pollution is the main reason behind such increased amount of patients of respiratory diseases. Bangladesh saw around 234,000 deaths, including 80,000 in urban areas, due to environmental pollution and related health risks in 2015, making it one of the worst affected countries in the world, reveals a World Bank report. A special report, titled "Health and Climate Change" launched by the WHO during Conference of Parties 24 (COP24), revealed that burning fossil fuels is not only heating up the planet, but also polluting clean air. In the process, around 70 million people in the world are dying every year. This is also leading to losses in the form of welfare costs worth $5.11 trillion. The report also presented recommendations for policymakers to mitigate the multifaceted impacts of a changing global climate on human health. 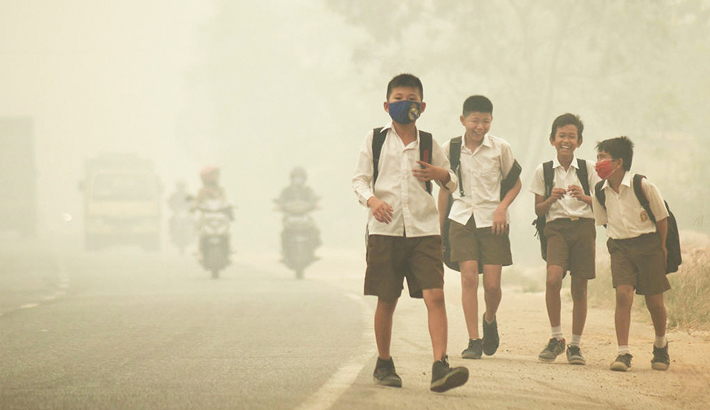 “We should make the climate fight the air pollution and promote healthier lifestyle,” said Team Leader, Climate Change and Health at WHO, Dr. Diarmid Campbell-Lendrum, the report’s lead author. He said the sources of air pollution are the same as those of greenhouse gas emissions which are driving climate change; hence steps to protect the climate will also pay for themselves in terms of health benefits. It is possible to control the air pollution, especially the unusual growth of dust, if the authorities concerned, including the City Corporations, Bangladesh Road Transport Authority (BRTA) and Dhaka WASA, carry out their duties properly.